Vintage Halo Diamond and Sapphire Engagement Ring | Shane Co. This gorgeous vintage inspired halo engagement ring will be cherished for a lifetime. Twenty round traditional blue sapphires (approx. 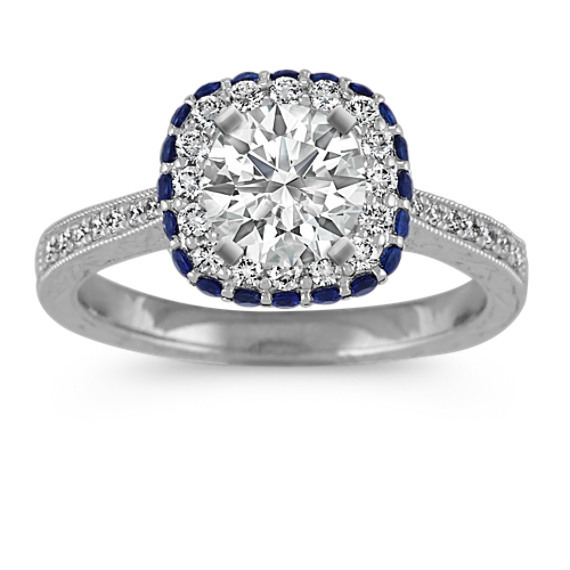 .30 carat TW) encircle the halo with bold color while 32 round pavé-set diamonds (approx. .30 carat TW) make sparkling accents through the halo and down the sides of the ring. Crafted from quality 14 karat white gold with milgrain and side engraved detailing, simply add the center diamond of your choice at approximately .75 carat. The total gem weight is approximately .57 carat and the ring measures 9.8mm wide at the center and 2.2mm at the band.